Well, remind me next time I experiment to do it on a smaller scale. These are 1/2 sheets of Rives BFK printmaking paper so they're 20" X 15" and I need to fill the sink in the kitchen to soak them and just moving them about is a bit of a project and I'd have got lots more trials done if I was just working on a 5 X 7" plate instead. I'd like to test in a little more controlled manner the differences of wet paint vs. dry paint; damper paper vs less; more or less pressure, etc. 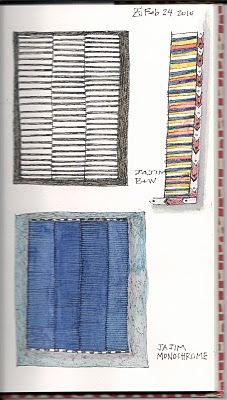 I am using Akua color brand water soluble colors again. 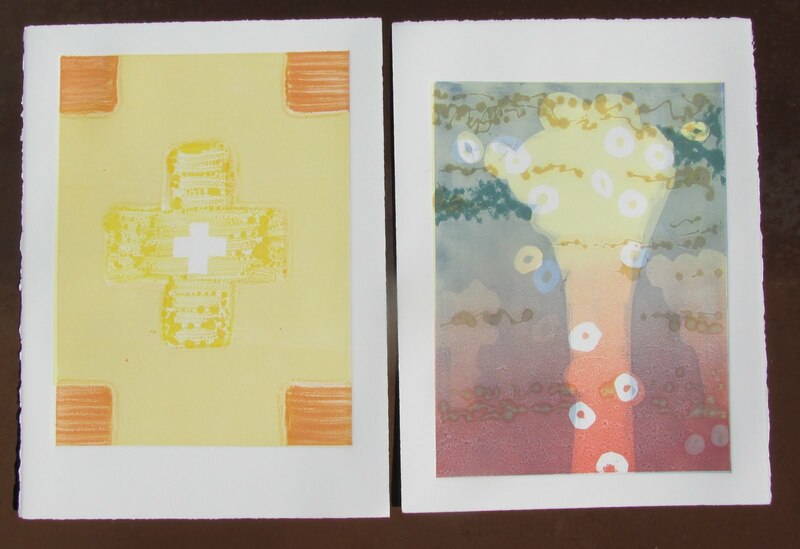 This time the monotype colors which are quite syrupy--I think there is both honey and soy oil in the mix? 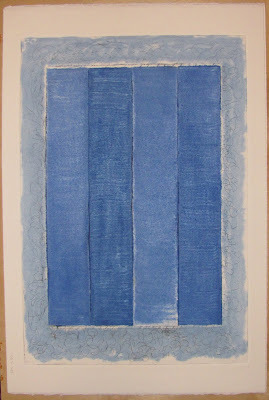 I decided not to roll out the color but just brush it on to the surface of my original plexiglass plate--I added some retarder to keep it from drying too fast and I deliberately brushed out each vertical stripe separately, remixing the colors each time for each stripe. I think my color was still a bit too thick and beaded a bit to the edges and I had a slight slip when I dropped the plexiglass on the damp paper--I tried to adjust it and you can see the results here where there is a big blue smear at the edge. But I got that kind of rich, deep, multicolor blu I was hoping for. I ran the leftover color on the second sheet of paper but it didn't really print so I repainted the plate again--this time adding a little cerulean blue to the border area before I ran it all through the press. I think the cerulean border is a bit too deep and I again had some edge issues--I can't keep the edges from bleeding a bit but I'll make them work with this print. 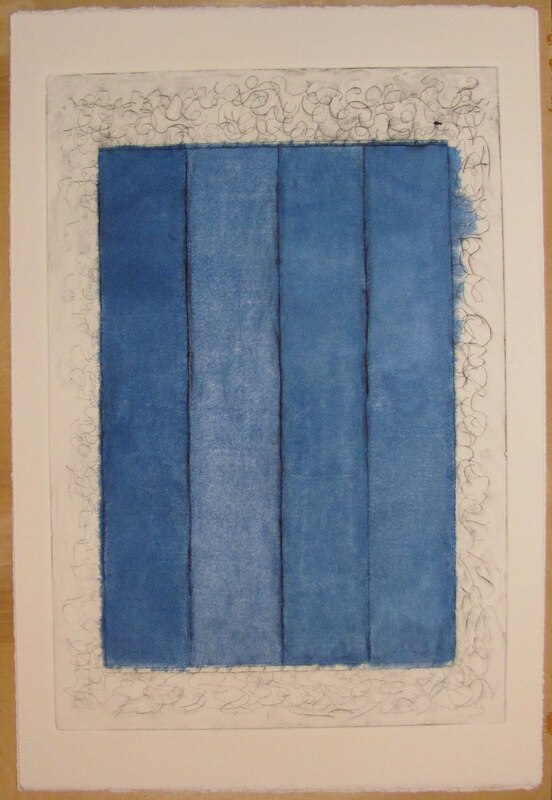 Mostly there is an area of the third blue strip that didn't print at the bottom that is bothering my eye and I'll have to get some blue in there and deepen a bit the saturation of all the dark blue stripes. I work tomorrow but maybe Friday I'll have another go. 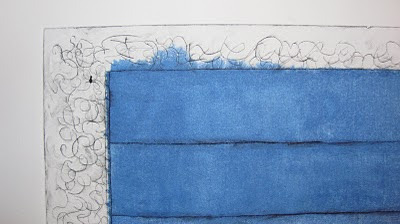 I'd like to add a hazy rose halo around the blue border of the carpet of the second trial and I need to deal with the blue smear on the first by trying to print around the edges with a different value and color to see if I can save it. The end edges were meant to be black and white but with all the smearing I'll probably go back in at the end with a brush and some opaque gouache. 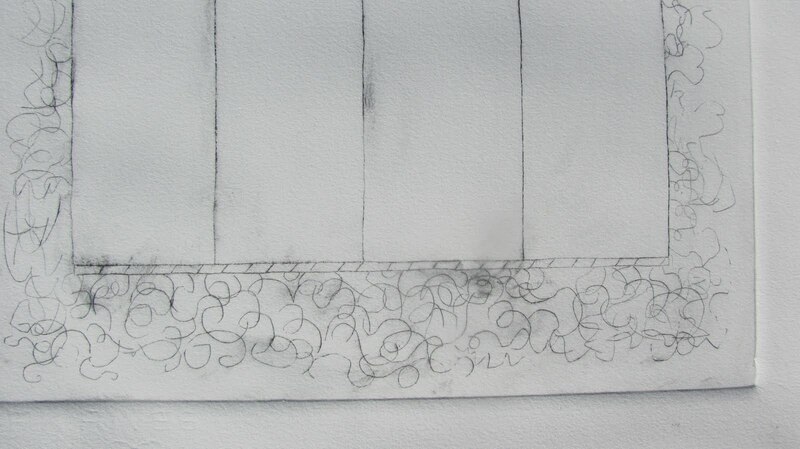 I've been going through my sketchbook again getting ready for my next woodblock print but I've got nothing really ready to go and I've been thinking and looking; doodling and making thumbnails. So, as I had really nothing ready yet to get put on a board I started looking around for something to do today. 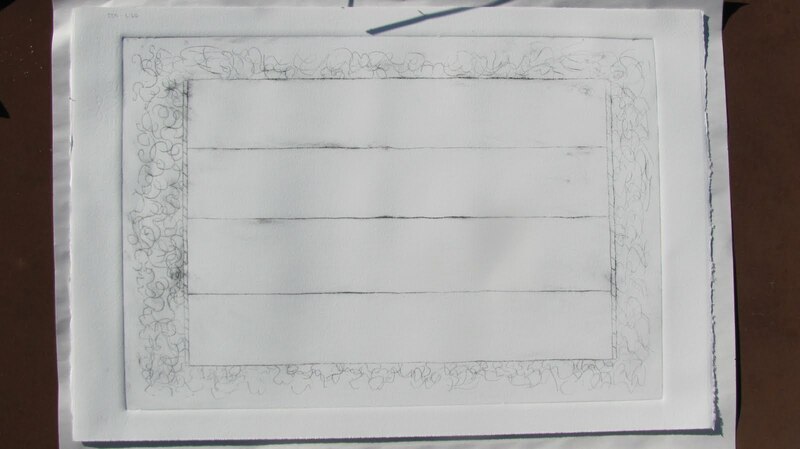 I took a piece of leftover plexiglass--it's about 18 X 24" and a drypoint needle I have and sketched out a rough enlargement of one of my previous textile/rug sketches. 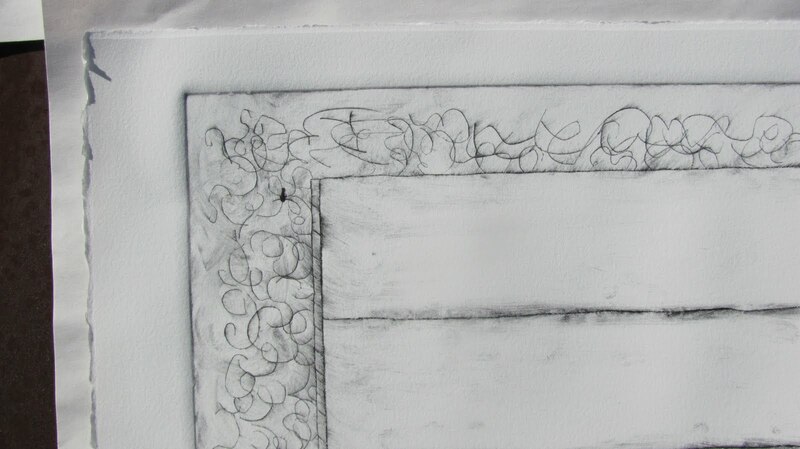 The drypoint tool has a really sharp point, and while it would be traditionally be used to scratch a line in copper or zinc plates to be run through a press, I'm using it on the plexiglass to score a line in the soft plastic. This afternoon I got to try how it would print. I'm still using Akua color--this time I have a tin of lamp black intaglio ink--and straight out of the tub with a piece of matboard scraping a thin layer of ink all across the plate. Then I lightly rubbed it off with an old rag and ran it through the Press onto damp Rives BFK. The ink is supposed to remain in the scratches and areas left by the burr of the point and should mostly wipe clean off the smooth plastic surface. It's pretty tacky ink and I've never done this before so my wiping was pretty lame. One came out a bit overwiped in spots and underwiped in others and my second attempt seemed "moodier" but ended up covered with dark fingerprints-spots and underwiped areas too. 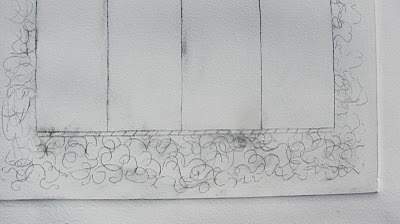 Still, the incised scribbles came out pretty good and it's pretty close to my sketch in concept and mood. 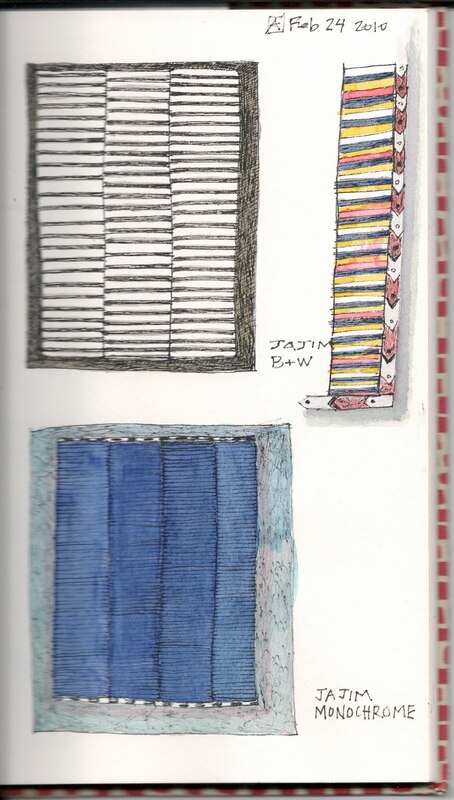 I suspect if I can get the colors to be rich enough all the splotchiness now will add depth and complexity to the stripes/weaving I'm trying to emulate. 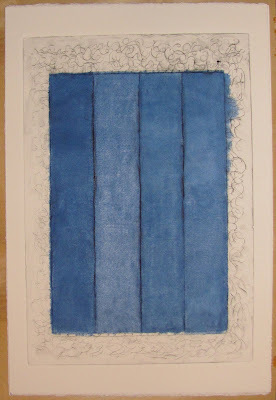 Tomorrow I'll try to go in again painting on the plate in color to bring up the vertical stripes in blue and the background in a sepia/tan--the only trick now will be I'll have to redampen the paper so the plate and paper will match up again. 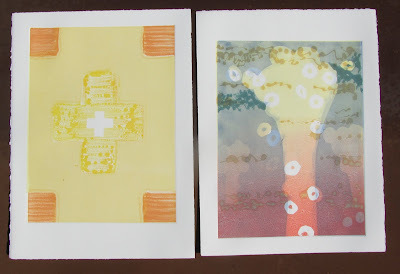 The last day of Beth Fein's Akua color monoprint/monotype workshop at the Kala Institute in Berkeley was a few weeks ago but I dove back into the September work schedule so couldn't update the blog. I forgot my camera so I'll keep it brief. 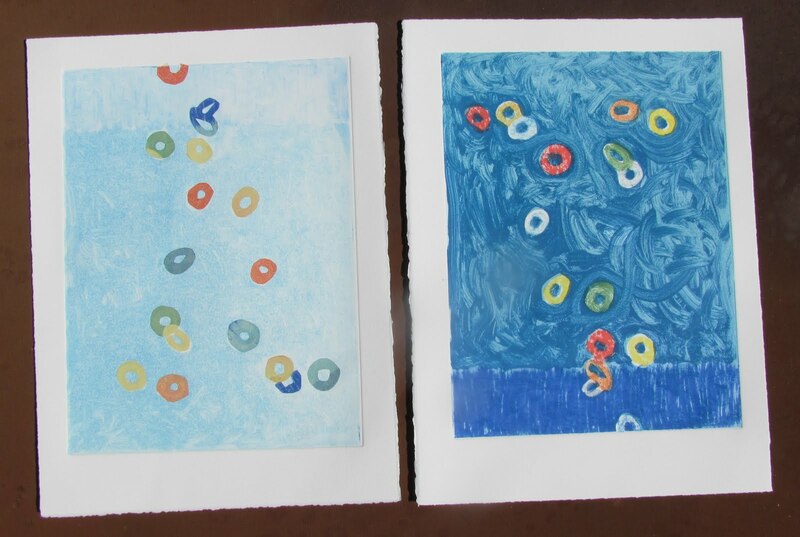 She demonstrated some viscosity resists/monotypes--changing the viscosity using various color modifiers to have the thinner colors resist the heavier for some spontaneous, mostly uncontrollable effects. Rather interesting but a bit too uncontrolled for me. I'm big on control. 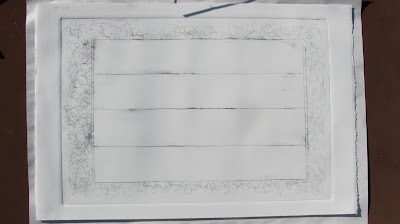 But we also worked on some Chine Colle'; using stencils to block out portions of color and by using decent thin washi or japanese papers using these now colored papers to go back in to add to the print in multiple layers. Here's what I managed to get out during the day's session. 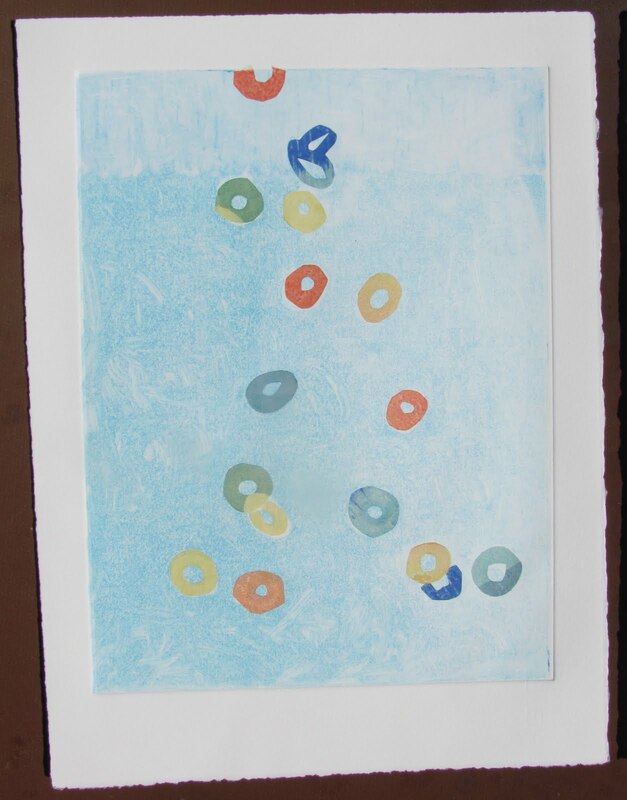 The dark "froot loop cascade" is a fairly straight forward monotype with rolled color underneath, then painted color in the next layer. 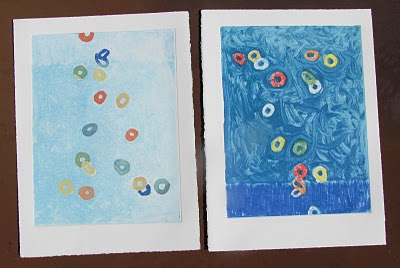 The circles were stencilled out and then using the cleaned plate painted in again using bright colors and a brush. All in all there are probably 4-5 layers/passes through the press. The ghost had the various layers run through after the darker version. 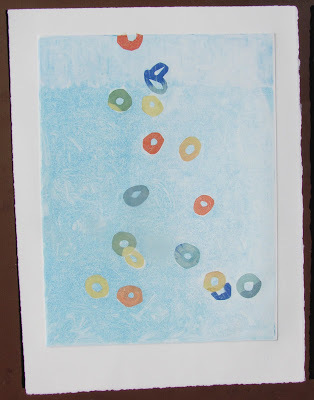 But in this case I used the cut out stencil circles accumulated during the days printings glued back in the ghost base using wheat paste and the press. I like the chine colle' pale version better but the brush strokes on the dark one are lively and appealing--if a bit childish. The last two were sort of "I'm getting tired and making lots of mistakes" but the mushroom cloud stencil thingy is sort of interesting and looks like if I push it a little bit might make a finished piece... I just don't know what yet. And the expanding cross/talisman will go through the press another 4-5 times before I decide if I should keep it or just throw it out. I had fun. Have a nice base now from which to start experimenting at home and will see what I can come up with on Big Blue. Mostly I wanted an alternative to the slow, carefully planned woodblock prints that are my main focus and these monotypes allow me to get into the studio and play with some ideas and colors in a way that's more direct and spontaneous and will allow me to flesh out some ideas before I decide if they're interesting enough to try in a multiblock woodblock print.